Last fall, my family visited Hoffman's Playland during its final weekend. The mood was as somber as it gets at an amusement park. The Playland was being sold after over 60 years in business, and at that point there were no known plans for saving any aspect of the park. 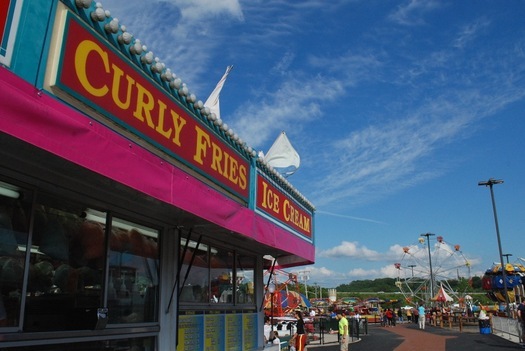 The land was headed to commercial development, the rides to auction. 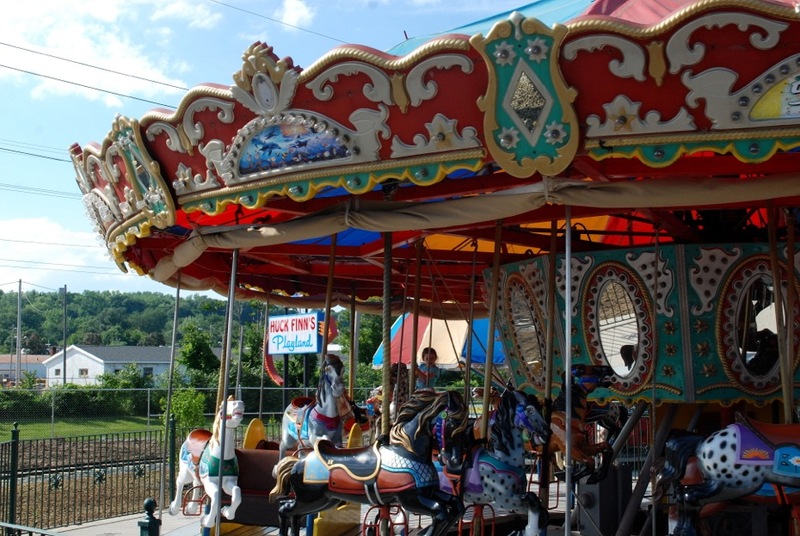 Hoffman's Playland was woven into the childhood memories of anyone who grew up in the Capital Region. It was the place to celebrate good report cards and birthdays, the place where we overcame fears, laughed with our families, ate too much cotton candy, grew up. It was a place we hoped our children and grandchildren would know and love. The thought of losing the Playland broke many hearts. 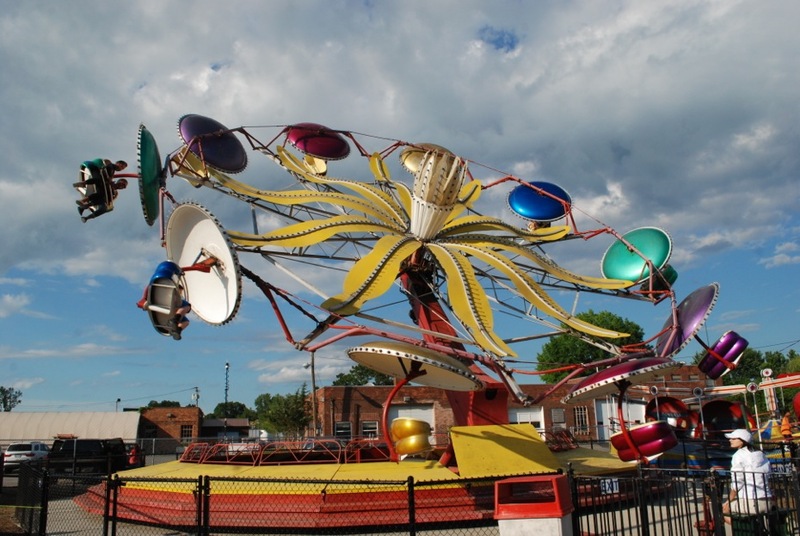 Just as the rides were set to be sold, Huck Finn's Warehouse announced that it would be buying all of the rides and opening a park adjacent to its furniture store in Albany's Warehouse District. 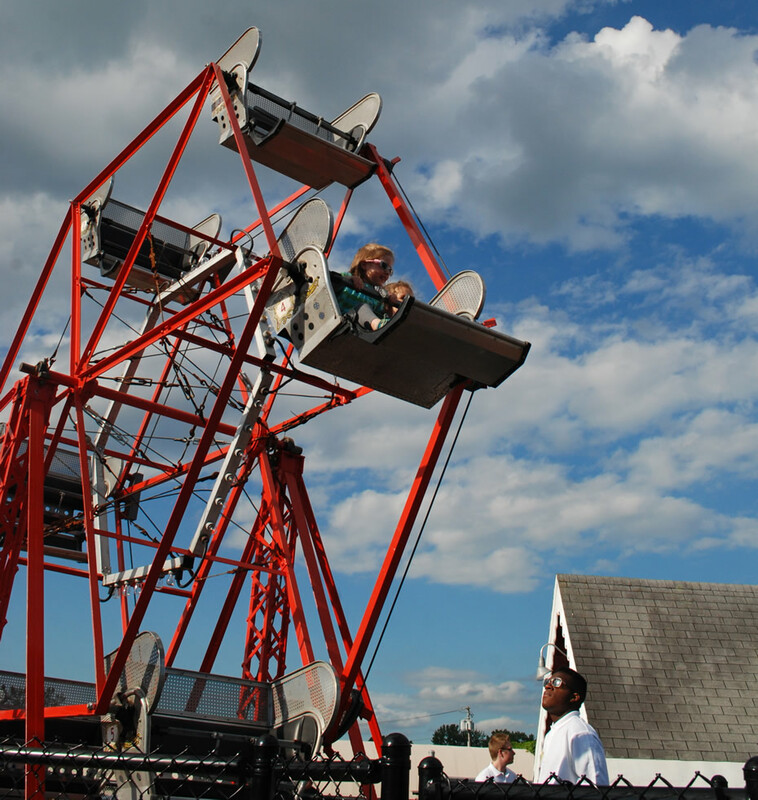 Huck Finn's Playland opened to the public last Thursday. I went by to check it out on Friday (with my 4-year-old Playland fan in tow, of course). We rode the train and the carousel together, she took the boats for a spin and made new friends on the mini ferris wheel. She got a chocolate-vanilla twist soft serve which melted all over her dress. She was a ball of glee. 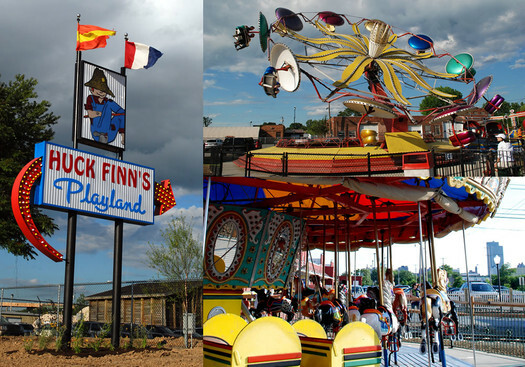 So, how does Huck Finn's Playland compare to Hoffman's Playland? I asked my daughter, and she said, "It's the same. Everything's here, everything's the same." And while that's not 100 percent true (alas, no bumper cars), she's right: the Huck Finn's crew put a lot of thought into keeping as much as possible the same as it's been since the 1950s. I wasn't sure what to expect, and I was pleasantly surprised by how thoughtfully-done the new Playland is, and the care taken to carry the history forward. The pricing structure and prices are the same -- no admission fees, one ticket per kiddie ride (two tickets for the bigger rides). Tickets are $1.75 for one, eight tickets for $12.25, 25 tickets for $29.95, and tickets are good all season long. The mood at the park on Friday was vibrant and joyful. There is still some disbelief that the story of the Playland didn't end, and that the rides live on. The train whistle is the same. 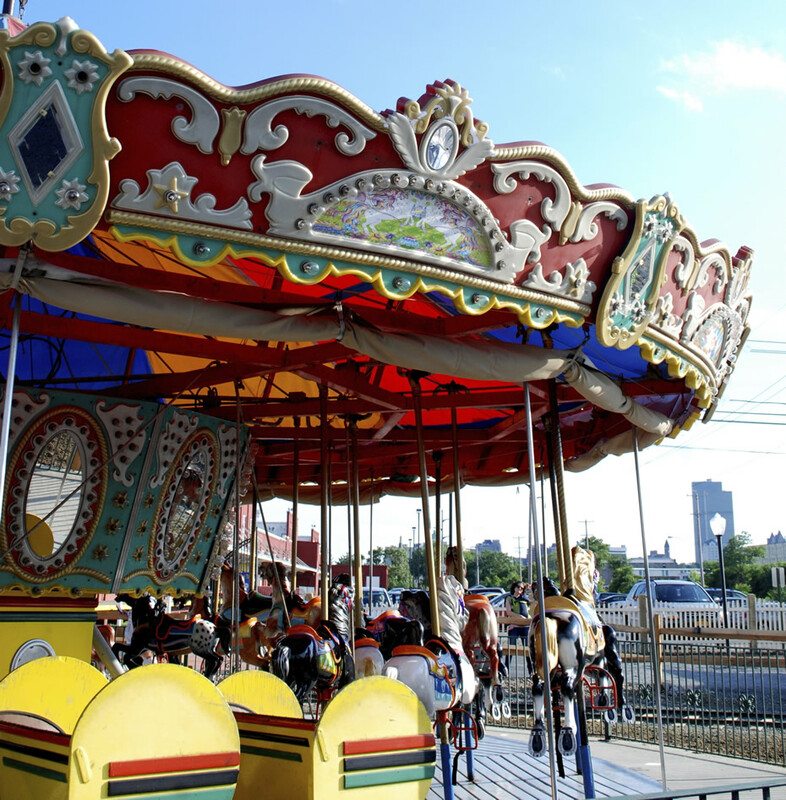 The boats, the caterpillar, the Ferris wheels, the fire trucks, the airplanes, the Tilt-a-Whirl, The Scrambler, even a recreation of the train tunnel -- they're all there, shined up, making kids shriek with delight. A couple rides had minor problems while we were there, but there was a fast-acting mechanic on site and the issues were fixed quickly. Of course, it's not Loudonville. I-787 is visible and audible from the rides. It is very clearly an urban setting. That's been criticized a bit, but it has the potential to be another boost for the growing Warehouse District. 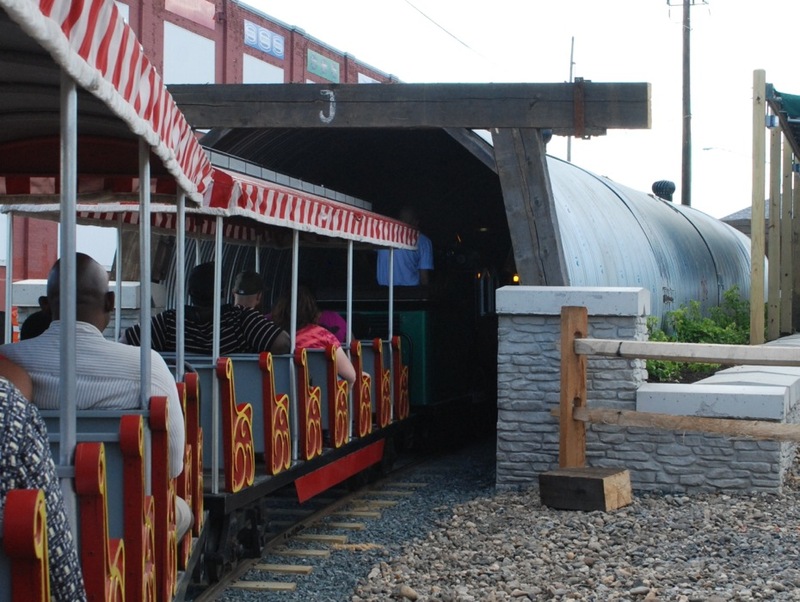 Upon leaving the Playland we discussed having dinner at Druthers, Wolff's Biergarten, the Pump Station, or several other favorite Albany restaurants just a few minutes away. Jeff Sperber, the principal owner of Huck Finn's, was walking around the park the night we were there. I asked him about the reception to the reincarnation of the Playland. "It's been fantastic. People are thrilled. Kids are happy. Everyone's happy to be here," he said. I wondered if he had any concerns about the new location -- there were some early criticisms of the Albany site, and taking the children's attraction out of the suburbs. "People forget about the fact that we've been doing business in this location for decades," Sperber said. "That's one thing I haven't been worried about. We have easy access to the highway, visibility from the highway, it's convenient. 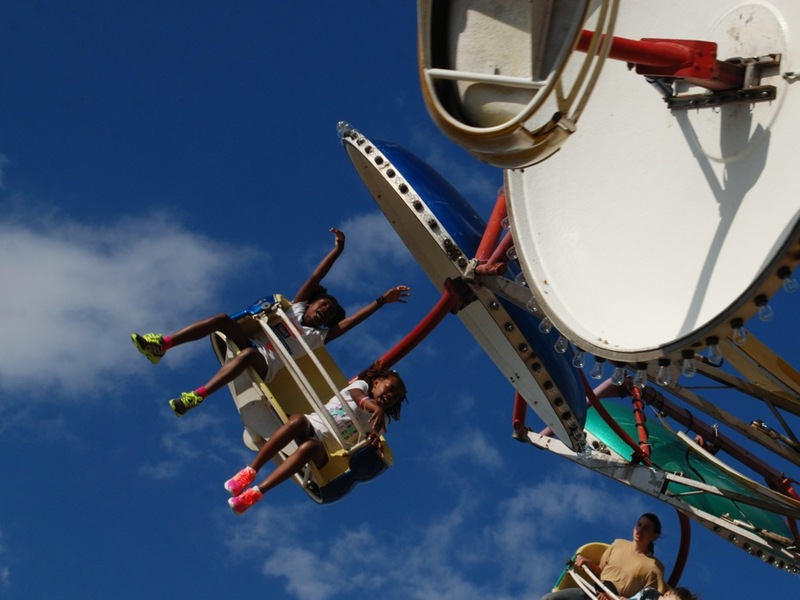 I think this is going to be a summer that will trump what happened last year, which was the biggest summer ever for the Playland." Sperber and his crews have been working around the clock to get the park ready to open as kids around the region finish school and kick off summer this week. The landscaping around the park is unfinished in places, and the large roller coaster is not yet up and running. But just a day after the gates officially opened, Sperber said, "The response that we've gotten, the positive feedback, it's far exceeded our dreams." And if my resident 4-year-old, already begging to go back, is any indication, the Playland is a dream come true for Capital Region residents of all ages. Nicole Correia writes at her website and is on Twitter as @nicorreia. I think it's great that it's near 787, it'll really attract people to the warehouse district. I haven't seen it at night but hopefully they have a ton of lights on all the rides to really standout. Do we know what the status of the bumper cars is? Are they planning to add them later, or is it just not cost effective to build? It's great that the Hoffman elements have been preserved at the Huck Finn lot, but moving rides onto blacktop in an industrial zone does not hold the same ambiance the Hoffman setting provided (e.g. trees, grass, residential and light commercial buffer). Rather, the Huck Finn Playland is a Hoffman Playland zombie - more perpetual carnival pad for young kids to get their ride fix at when the county fairs are not happening than offering the comfortable family entertainment zone vibe it had prior. Some suburbanites have a prejudiced against urban environments, and they'll naturally be less likely or unwilling to bring their family into the "scary" city. As someone who finds places like Wolf Rd and Route 9 in Latham terrifying, I'm actually quite sympathetic. Fortunately, on the other end of the spectrum there will be loads of people who see the new location as more convenient due to it's proximity to the highway and urban center. When it comes down to it though, the most relevant demographic here is the kids, and they tend not to exhibit the same prejudices. 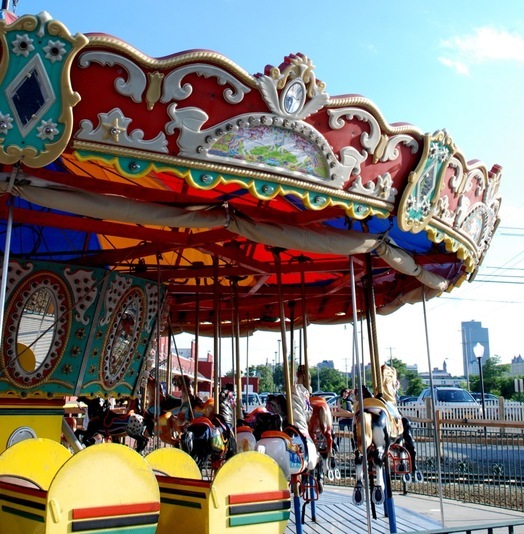 To a kid, what's the difference between a quirky perma-carnival out-of-place in a sea of strip malls and a quirky perma-carnival out-of-place in a sea of warehouses? Bumper Cars - Huck Finns said the initial 2015 rollout would be all rides except the bumper cars. There is more work to moving them so they wouldn't be ready until 2016. Regarding comments about grass/pavement - you walked on pavement at Hoffmans and there was grass in sourroundings. The same is true at Huck Finns - they hydroseeded the grounds but the grass needs a few weeks to sprout and grow. I also heard the midway games were moved into the main store near the Bassett showroom but were planning on being more advertised once they finished the playland opening. My family went to the playland the other night and thought it was fantastic (we also found our brick around the flag pole). Jackers - The proximity to a neighborhood is already having a positive effect - we saw a family walking from the playland back to their house, walking along Erie blvd. That is something that would not have been likely in the old location. Change just isn't easy. But this is one of the good stories. I grew in a household in which Hoffman's was a summer staple. My mom, aunt, their cousins, all were part of the first wave of kids to enjoy the park. In the 80's there I was, riding what I could based on grades. An "A" earned me 5 tickets. I did not ride a lot of rides. After my son was born the excitement of passing along the tradition neared spontaneous combustion. News the park was closing after just one round of visits with my little one had me so deflated I thought this could be the final straw of little annoyances. "They're closing Hoffmans!? $^&# this place! I'm calling a realtor!" After the seven stages of grief had each their turn, and news broke of Huck Finn's 11th hour rescue, I was back feeling the father's "postpartum" elation. Make no mistake, this is a big good news thing for Albany. BTW an idea to connect the Playland to the Corning Preserve Bike Trail: See that little rail spur between 787 and the property boundary lines on Erie? When I first heard about Huck Finn's purchasing Hoffman's rides, I wasn't sure what to expect; but I was happy that they would be staying local and future generations of kids will have a chance to enjoy them. I took my kids there yesterday, and I was not disappointed in the least. I think the layout, while more compact; is actually better than the previous location. Everything can be accessed by a wide, central walkway- very convenient without feeling cluttered. The landscaping is still a work in progress, but hey; it only opened a few days ago. Give it some time. For those lamenting that it is located in an industrial urban setting; I find that this is much more noticeable upon approaching the park than it is once you are inside. To be honest, I was never a huge fan of the original location. Route 9 in Loudonville/Latham can be a real ordeal, especially certain times of day. Personally, I don't find strip malls and car dealerships any more visually appealing than warehouses. I actually think the surrounding scenery is better for the most part- you can see downtown, Nipper, and the Argus Press Building. 787 is only really noticeable on when you're on the train, and then barely. I think if they are to plant a few trees, you'll barely notice the surrounding warehouses at all. Overall very pleased, and I will certainly be back. My kids also loved it, so I guess that's all that really matters. I love how this is right off of the bike path, so we can ride over and hang out from Troy. 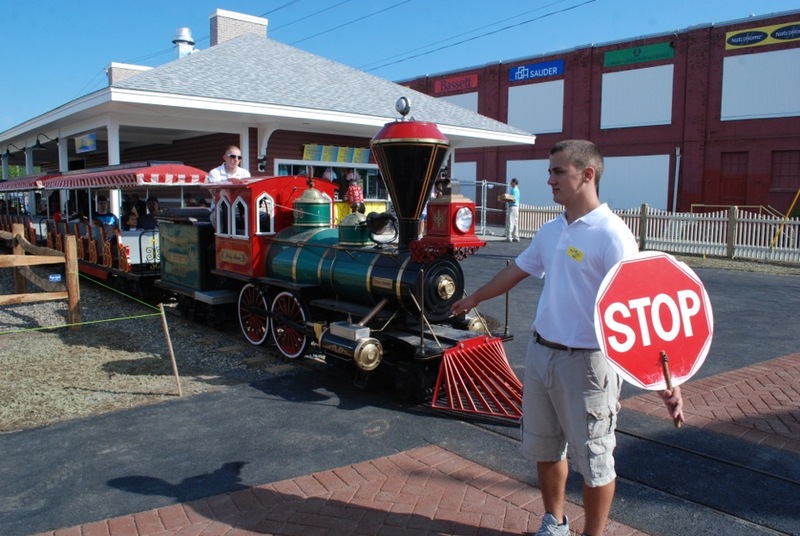 I just can't get over what a great story the whole Hoffman's/Huck Finn's Playland has become. Because 49 times out of 50, beloved local throwback-style places such as Hoffman's just close down and a lame medical building or CVS is built in its place, a sad event simply chalked up to a sign of the times. Big credit to Sperber for the vision to step up and take this on. And from this article it seems like he really took the effort to do it right. So glad this has turned out so well. And really, it's about the kids experience, not the adults. I'm also thankful that no one (has yet) whined that there's no riverfront access. We went yesterday and had a great time with the kids. They are clearly still working out some kinks, but it's all worth it for the kids. After months of reading about the move,I couldn't wait to bring my family to the new Playland.Simply put we were blown away.Hucks Playland totally captures everything that Hoffmans had and then improves on it.The rides never looked so good...after years of showing wear,they now look brand new.The layout is a huge improvement,a very cool walkway,lots of places to sit in shaded areas,plenty of food service stands,extra ticket booths,amazingly friendly staff,extremely well lit,I could go on and on.Huck built the coolest tunnel I have ever seen.They also made a huge investment in landscaping....it's humorous to me that some people don't realize that things like grass and trees have to grow but they are all there.Most amazing is that Team Huck did all of this in time for this summer.....we are blessed to have Huck Finn as our neighbor. I took my 4 grandchildren ages 7,6,4,2 they had so much fun .so clean and the staff was very friendly. Its everything and better then Hoffmans ,Will be going again before they close .